RIP ( Rest in protein) because brotein has been officially kicked off of the show. In true Chadhole fashion, he had to make one last scene. He creepily walked through the woods whistling until he 'found' the house. Meanwhile, the guys are dumping protein powder singing kumbaya. Chad did not make nice with anyone and left on terrible times. First, let's start with my top five list from last week, Chase, James Taylor, Jordan, Luke and Alex. Let's see how these men scored in this episode. Bikini, booze and Brittany...JoJo is so into Jordan and as if all of the kissing, flirting and heart shaped eye emojis were not enough, JoJo brought up Jordan's ex. It is so random that it was just brought up in this episode. Do I think she met his ex? I have no idea, but I do know because of the way Jordan smoothed it over, that it will be shocking if he does something to make her upset enough to send him home. 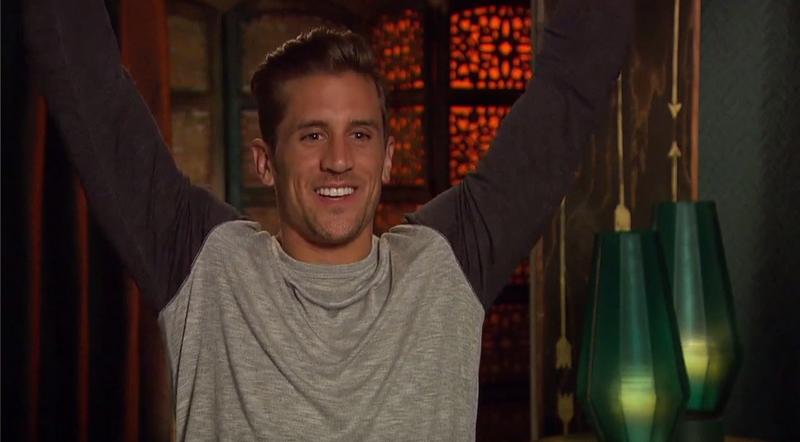 Since bringing the wine on the first night and random moments, this was Robby's moment to shine. They jumped off of a cliff and faced fears together. Robby shared that he had a friend that had died and that changed his perspective on everything. That story is tragic, but off-air that did not stop his ex from kissing Chad or saying that she was dumped right before the show. Although, these men are the top as far as the show goes, it is unclear how they are in real life. Chase is one of my favorites. He is calm and stays consistent throughout the weeks. While one may call him boring, most Bachelors in the past have been viewed as boring, Sean, Chris, Jason, etc. I guess we will have to wait and see if he is the dark horse and steals JoJo's heart or if he has multiple roses in his future. Luke stays on the list because of their connection and how he reassured her after the tabloid issue. It is impressive when a man on this show makes the lead feel better and Luke accomplished it. The fact Chad would not leave gets him on this list for the last time this season. Fortunately, he will be on Bachelor in Paradise. Cheating Chad got in the tabloids after JoJo left, but before she got back to Texas. I am sure glad he did not make the cut. However, this scene was overproduced, because how many seasons has the lead or his/her contestants looked at magazines? He needs too much reassurance for a person who agreed to go on this show. Old story is now heaving a recap in this time it is good in this time we are taking something serious and that help us to increase that https://www.analyzedu.com/writing-services-reviews/essayontime-com-review length which is helping us to increase the worth and that is the best time which is growing more knowledge.